By far the smallest of Mints, this charming plant forms a flat carpet of tiny bright-green leaves with an intense creme-de-menthe fragrance. Minute mauve flowers appear in midsummer. 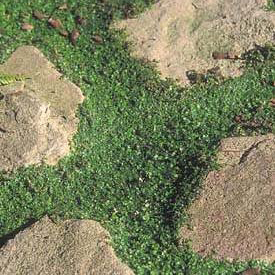 Perfect for planting between paving stones in a moist, part-shaded area. Stepping on the plant will release the pleasant scent. Where plants are not winter hardy this is still worthwhile growing as an annual, and it will often self-seed for several years. Nice also as a carpeting plant to cover the soil in pots beneath taller-growing specimens. Easily increased by ripping apart into smaller pieces.